Business is on the move in Israel, and you need a business email list that can keep up with your target audience. Bookyourdata.com has the most comprehensive Israel email database in the industry, and we will help you to find quality sales leads. 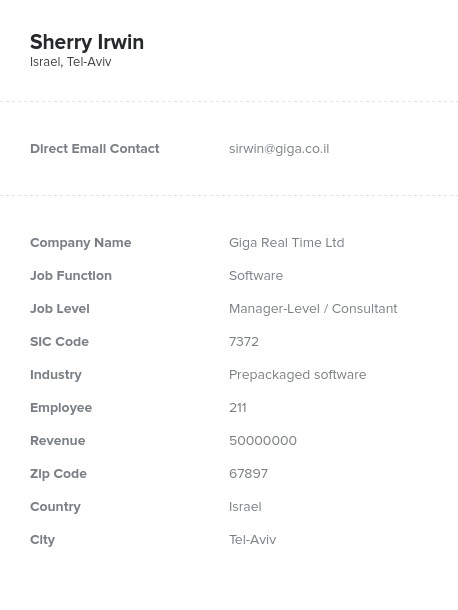 Technology and education are big businesses in Israel, but they are just part of the business world you can become part of with the right email marketing list. We have the Israel mailing list you need to reach decision-makers in your target audience and grow your business. Our Israel email list is human-verified to make sure that you don't waste time talking to people who won't ever talk back. We offer a reasonably priced, high-quality Israel email database that you can use to enhance your business database or as the foundation for developing a whole new set of sales leads. Each Israel mailing list we offer has contact names, phone numbers, and email leads you can actually use to advance your marketing programs. Let us be the resource you use to reach important contacts in Israel and make inroads with your target audience. You can use our comprehensive, pre-built Israel email list as your marketing secret weapon, or you can take just a few moments to make your own customized Israel email database using our easy list-builder tool, filtering contacts by location, company size, job title, and more. Either way, you'll be well on your way to a successful marketing campaign!